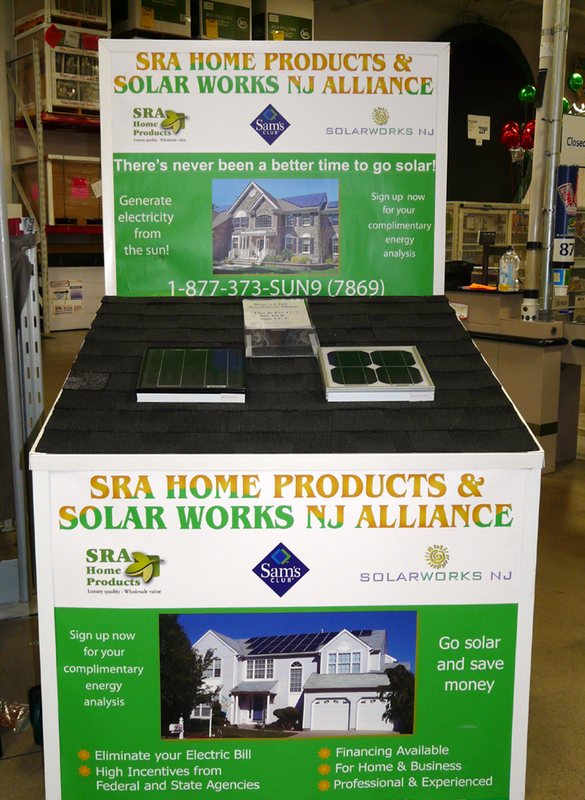 TURNERSVILLE, NJ– SolarWorks NJ, LLC, a leader in designing, managing, and building turnkey solar electricity installations and renewable energy solutions, today announced a partnership with SRA Home Products and Sam’s Club called SOLAR ALLIANCE. Created to bring Sam’s Club members the best in solar technology, a solar exhibit will be at several Sam’s Club locations throughout New Jersey to educate its members of all of the environmental and financial incentives that switching to solar has to offer. Every two weeks, the display will rotate to other Sam’s Clubs, ensuring members all over the state will have the chance to be educated on renewable energy. As an approved NJ BPU solar company, a SolarWorks NJ representative will explain the benefits of a solar installation, and why now is the perfect time to think about switching to the renewable energy source to Sam’s Club members, as well as answer any questions they might have. If interested in finding out more about a system, customers will have the option to fill out an information sheet, and be contacted by SolarWorksNJin the future. Sam’s Club members can rest assured too. If they decide to purchase a system, Sam’s Club backs the system provided by SolarWorksNJ, and will have every assurance through Sam’s Club that they will be fully pleased with the system. Since 1983, Sam’s Club has passed on savings by eliminating unnecessary costs and maintaining a simple shopping environment to more than 47 million members. Quality, name brand merchandise at exceptional prices is a concept they take to a higher level, which makes Sam’s Club a terrific destination to save money. SolarWorks NJ, LLC (SWNJ) is a premier solar energy integrator with offices in Turnersville and Denville, New Jersey. Founded in 2003, SWNJ provides full-service renewable energy solutions to residential, commercial and agricultural clients in the tri-state area. SWNJ designs and installs solar energy systems. Ranked #1 by the prestigious Philadelphia100 and the NJ “Top 25.” Recognized by NJ Biz Magazine as “Emerging Business of the Year.” For more information please visit www.solarworksnj.com.